This article starts “The People’s Climate” blog series by Heather Menzies, author of Reclaiming the Commons for the Common Good: A memoir & a manifesto. In Reclaiming the Commons, I praise Bill McKibben and 350.org as Luddites for our times for championing limits on energy extraction. # One: On why a “People’s Climate” works, but only so far. 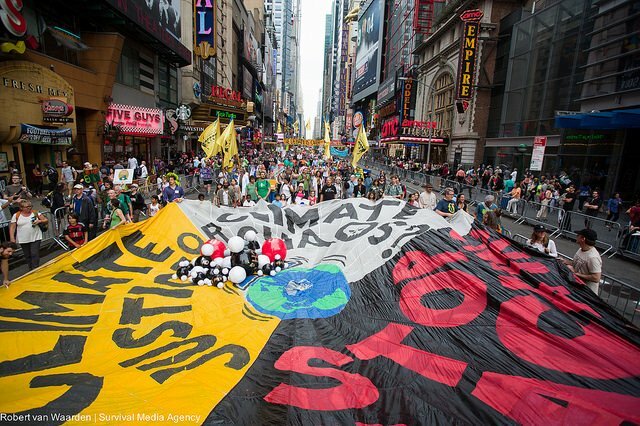 If you’d marched to the UN shouting “the people’s climate” 20 years ago, it wouldn’t have made sense like it does now. Two things have changed. Back then, scientist-experts informed government decision-makers who spoke and acted to defend common-good things like the climate and the environment on behalf of people and the planet. Sometimes they needed a nudge from opposition parties and civil society groups, but that generally moved things along, sort of; though the crisis kept deepening, becoming more palpably obvious too. Now civil society groups –the people– are taking the initiative, informing themselves of the science and telling decision-makers what to say and do, NOW. The fate of the earth, and of its climate is no longer a scientists’ or official policymakers’ issue. It has become a people’s issue.